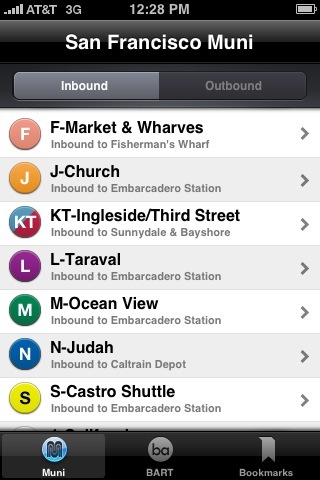 As a habitual SF Muni rider for close to 10 years, I have become keen on new Muni iPhone apps. Bottom line, they’re nothing but useful. They save riders time by showing arrival times of any given bus. I recently downloaded Smart Ride, and enjoyed its features. First of all, it’s free. That’s huge to me, because I really only download free apps, no matter how popular they are. I’m sure a lot of Muni riders will appreciate this also. The user interface is clean and easy to understand. The app asks for permission to locate your current location, and proceeds to bring up a page of nearby stops and their next arrival predictions. Smart Ride also displays the approximate distance (in feet) to each bus stop. This may seem frivolous, but it’s actually pretty interesting to know which stop is technically closer to you! 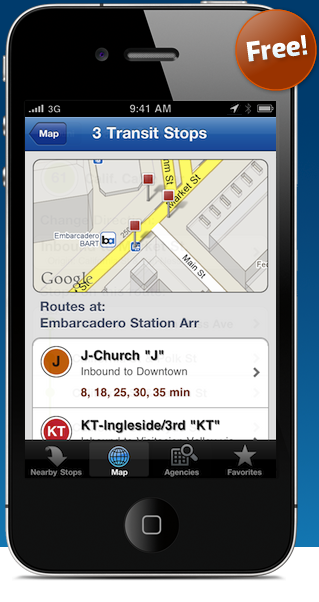 The app also features a live map and a directory of different public transportation agencies. I found this a positive thing, since it would be useful when traveling in different cities. I particularly like the fact that the directory stays on your chosen agency (SF Muni) even when you are using the other features of this app. I find it frustrating when some apps reset once you veer away from a certain location, and the user is forced to go back through the motions of choosing their preferences again. From my experience, Smart Ride’s predictions have been accurate, and I have enjoyed using this application. The Favorites feature sets it apart from some Muni apps out there. It allows you to save your frequently used stops, which is extremely helpful when you’re in a rush! Overall, I am pretty pleased with Smart Ride. It covers all the bases, and is quick and easy to understand. Thanks for saving me time, Smart Ride! As a longtime SF public transportation rider, one of the websites I visit the most wheatear it be on my phone or my laptop, is NextBus.com. For the most part, NextBus does what it’s supposed to do, and if you’ve visited their website on your smartphone, you know that it’s visually bare and very basic. There are no maps or bookmarks. Every now and again, I would use the free Routesy app. But the reason I don’t rely on the free Routesy app often is that the app would crash on me and was just too unreliable. Muni Diaries was looking for testers to play with a beta version of the new Routesy app. 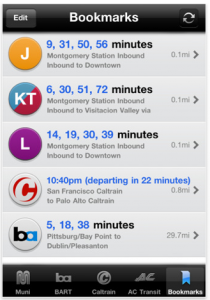 I volunteered and have been using the new app for a few weeks, mainly to look-up Muni schedules. I have to say, I like the new and improved Routesy. My first impression: this is a whole new app compared to the free Routesy I’m familiar with. They’ve updated their icon, an homage to the old Muni FastPass (RIP) and added two new transit schedules: Caltrain and AC Transit. I initially had some issues with the GPS map feature after installing the app, i.e., it didn’t seem to know where I was. But this was fixed by closing and re-launching the app. I think this was a fluke because the GPS has been accurate eversince. As for the app crashing, well, it happened twice, but that’s it. I don’t know if this was due to my phone having too many apps running or AT&T’s notoriously bad service. My guess: it’s a little bit of both. One of the first things I noticed with the new Routesy is the GUI. It’s much better compared to the old version. The list of Muni lines is much easier to see and read. The new app now gives you a list of Muni bus/metro lines with a drop-down menu giving you a choice of inbound or outbound route, which will then give you an arrival schedule. 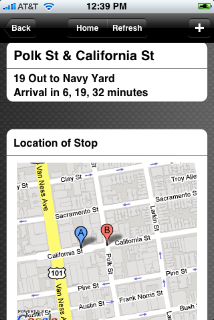 In the old app, I had to choose a route first, inbound or outbound, then pick the bus line to get the arrival time. This could be just a matter of preference (since it’s the same amount of steps to get the schedule), but I like the new version better. It made more sense to me. The only thing I would change is for the drop-down menu to be hidden or close automatically after getting the schedule. Right now, after you’ve chosen a bus/metro line, it stays open, and there is no way to close the drop-down menu. The bookmark feature that I love in the free app is the also in the new app. This is such a great feature and a time saver! My favorite stops right there, no need to look for them every time. 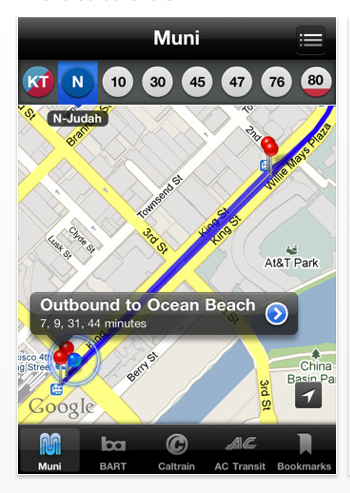 I also like the “other routes” option and map that shows up on the Muni bus/metro line that I’m looking at. I like that it gives me a heads-up that while the 14-Mission bus I’m waiting for won’t be here for another 20 minutes, the 49-Van Ness will be here in 5 minutes, and it will take me where I want to go. I don’t know whether any of the other transit apps have the bookmark or other routes feature. I know my old standby NextBus.com doesn’t have them. As for arrival accuracy and when I compared it to NextBus.com, the new Routesy is off by a minute or three, but this doesn’t bother me too much as long as I know the bus I’m waiting for is on its way. Would I pay $5.00 for the app? The price is a little on the high side but reasonable considering you’re getting Muni, BART, and now Caltrain and AC Transit schedules on your phone. And if the developer keeps updating and improving the app, I wouldn’t mind paying $5.00 for it. You can buy the pro version of Routesy 3.0 here, or download the free version (2.5.5, does not include many features found in Pro 3.0) that Angela refers to above here (links open in iTunes). Update: (Sept. 1, 2009. 10:30 a.m.) Since we first published this post, we’ve received a few more juicy bits of Muni merchandise. First, as seen at SF Zine Fest, PunkPunk is selling FastPass buttons and pins (above). At $5 a pop, get ’em while they’re available. I’ll have a set of 12, please. The phrase “economic stimulus package” always makes me feel a little inappropriate. But say you have some extra cash to, er, help the economy — we’ve found some great Muni stuff for you to spend it on. Muni Shirts by Walter Konig (of Walnotes) are based on a design that was sold in New York a few years ago. “When I saw them I wondered why they didn’t have them for San Francisco. So I sat in Cafe Abir and designed them. I used a Muni Map to figure out locations along the way,” Walter told us. The shirts come in a variety of colors, many of them printed on American Apparel tees. Walter said that Lower Hater (597 Haight Street) will have them soon, too. More shirts and other goodies after the jump, including a really awesome hoodie with an old-school Muni bus print and buttons made from old transfers. Now that it’s come out of forced hibernation and I have a chance to pick this review up where I left off, I have to say — Routesy sure is one slick iPhone app. I barely had a chance to tinker with it before it was taken off iTunes, following the much-covered flap between the app’s developer, Steven Peterson, and NBIS, a shady couple of dudes claiming ownership over the prediction data that helps power Routesy. Well, that was all fine and dandy, but now Routesy is back, and perhaps owing to my sense of anticipation, it’s on top of its game. The drunk pubescent boy sways in the seat next to me: “blah, you and everyone has an iphone!” I turn my eyes into slits and ignore. Then the girl with the tiara starts screaming like a banshee, but several pitches lower – I dunno, like a manshee? banhe? She runs up and down the train, drunk and muffin toppy. Read the rest of Denise’s post to see if the rowdy kids got their comeuppance. Check out other popular posts this month: Tiffany’s hilarious clairvoyance into the mind of Guy Who Takes Up Two Seats and Tara’s interview with SFMTA spokesperson Judson True. Got your own Muni story to tell? Submit it to us so your story can be in the running for the post of the month for May!